The TC646 is a switch mode fan speed controller for use with brushless DC motors. Temperature proportional speed control is accomplished using pulse width modulation(PWM). A thermistor (or other voltage output temperature sensor)connected to the VIN input furnishes the required control voltage of 1.25V to 2.65V(typical) for 0% to 100% PWM duty cycle. The TC646 automatically suspends fan operation when measured temperature (VIN) is below a user-programmed minimum setting (VAS). An integrated Start-Up Timer ensures reliable motor start-up at turn-on, coming out of Shutdown mode, or following a transient fault. In normal fan operation, a pulse train is present at SENSE, pin 5. 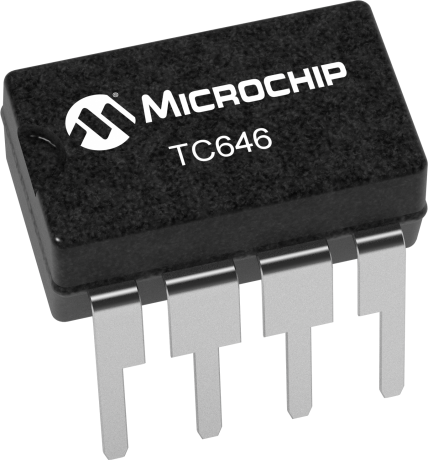 The TC646 also features Microchip Technology's proprietary FanSense™ TM technology for increasing system reliability. A missing-pulse detector monitors this pin during fan operation. A stalled, open, or unconnected fan causes the TC646 to trigger its startup timer once. If the fault persists, the FAULT output goes low, and the device is latched in its Shutdown Mode. FAULT is also asserted if the PWM reaches 100% duty cycle, indicating a possible thermal runaway situation, although the fan continues to run. See the Applications section for more information and system design guidelines. The TC646 is packaged in a space-saving 8-pin plastic DIP, MSOP or SOIC package and is available in the industrial temperature range.